Widely acclaimed as “one of this generation’s top influential players,” we are thrilled to welcome Andy to the family with his first TrueFire course, ShapeShifter! You will likewise be thrilled when you dig deep into the shape-shifting techniques and creative approaches that Andy presents throughout his innovative curriculum. Andy organized the course into three sections. In the first section, he demonstrates and explains 9 key techniques and concepts: Major Pentatonic Connections, Basic Harmony Foundations, Alternate Picking, Cross Picking, Basic Legato, Slides & Faux Slides, Vibrato & Bends, Blues Foundations: Licks & Tricks, and How to Approach Tone: The Gear & The Hands. Style Shapeshifting is the focus of the second section. Andy demonstrates how to ‘shapeshift’ the essential techniques and concepts presented in the first section to be able to play in other genres with more authenticity: Adding Country Flavor: 1, Adding Country Flavor: 2, Adding Rock Flavor: 1, Adding Rock Flavor: 2, Adding Jazz Flavor, and Musical Self Awareness Philosophical Approach. Andy will explain and demonstrate all of the key concepts and approaches along the way. You’ll get standard notation and tabs for each of performance studies. Plus, Andy includes all of the rhythm tracks for you to work with on your own. In addition, you’ll be able to loop or slow down any of the videos so that you can work with the lessons at your own pace. 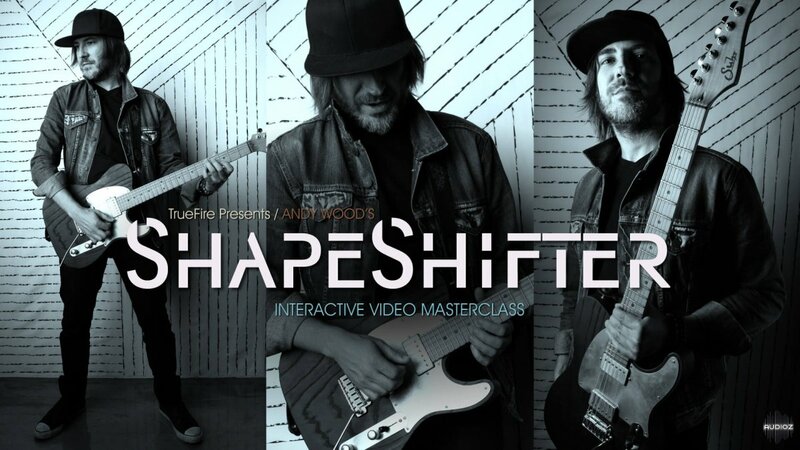 Grab your guitar and let’s shapeshift with Andy Wood! This is one of the BEST guitar tutorials I've ever watched. You won't be disappointed. WOW! Thx Sunny for this one and the Matt Schofield!! Thanks Sunny for the player, great job !! !